Laia Serrano, the economist who founded BarcelonActua a year ago, says that it will be people power that fixes Spain, not the government. BARCELONA — With two small children and no income for the past two years, Antonio Delgado, 44, says things were so bad he had considered taking his life. Then a few months ago, Delgado found out about a group that rents small parcels of farmland cheap near his town of La Rinconada in southern Spain. Now he’ s bringing home boxes of tomatoes, onions, peppers, lettuce, zucchinis and pumpkins. But he is not selling them. Delgado and others are bartering, or trading, their way through a recession that has lasted years and left more than a quarter of the workforce unemployed. Tens of thousands of households have no wage earners, but they have skills and time on their hands to do work that can be traded for things they need but have no money to buy. Banker Julio Gisbert, author of the book and blog Living Without a Job, says Spaniards are doing what makes sense in these tough times. “It is possible to live without a job, and that doesn’t mean living without working,” Gisbert says. Trading produce for other services and merchandise is one of the many unconventional ways the Spanish are making ends meet in what has been described as the new “sharing economy” that has developed here since the economic crisis hit more than four years ago. According to the Spanish government, more than half a million families have no income. The unemployment rate has climbed to 26%, but among young workers it is as astonishing 55%. The deepest economic crisis in Spain’s modern history is rooted in a housing boom financed by cheap loans to builders and home buyers who went bust. Homes were not worth what was borrowed to buy or build them. Spain borrowed to lend the banks money to survive, but that put the national government in a budget deficit. Regional governments that spent budget surpluses in boom years were forced to end public spending and cut benefits and jobs, hobbling economic growth. The economy, which grew 3.7% a year on average from 1999 to 2007, has since contracted at an annual rate of 1% since. With few jobs and no disposable income, bartering and other ways of exchanging goods and services are increasingly seen as good alternatives. Some Spaniards are using so-called time banks to “deposit” time, knowledge and skills and trade them for things they need. All services have the same value, whether it is one hour of teaching a foreign language or one hour of cleaning house. Teresa Sanchez, 55, is part of the Time Bank in Valladolid in western Spain. She has deposited offers of Japanese language classes, massage and company for the elderly. In return, she has received English lessons, appliance repairs and haircuts for her son. The number of time banks in Spain has doubled to 318 in the past three years, according to the Association of Time Banks. SocialCar.com allows people to rent their private cars to other individuals while JoinUp Taxi makes it easy for people to share taxis to the same destination. Nolotiro.org (“I Won’t Throw It Out”) allows people to give away things they don’t need anymore, such as clothing or tools. Mi Huerto Compartido (My Shared Garden) allows land owners to “lend” ground in exchange for part of the harvest. And Truequebook.es users barter school books and other goods for children. Delgado got his plot of farmland from My Harvest Ecological Gardens, which rents 540-square-foot parcels of land for $40 a month. He works the land 20 hours a week and exchanges produce with other small farmers so he can get the wide variety of food his family needs. 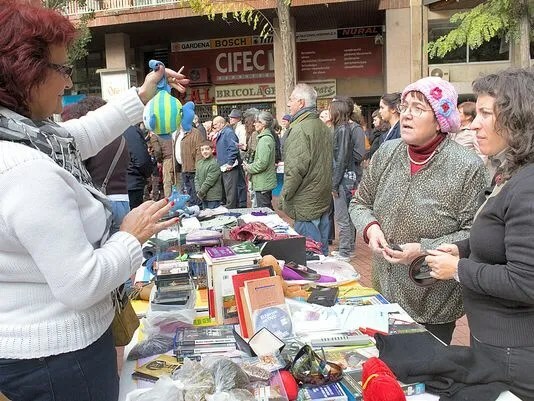 Besides the cybermarket places, nearly 100 bartering markets have appeared in Catalonia alone, according to Intercanvis.net, a site that tracks the bartering economy in this northeastern region of Spain. Unlike other European countries, where thrift shops thrive, or in the United States, where garage sales are common, Spaniards have always been reluctant to buy used goods. In fact, just a few years ago, it would have been unimaginable to hear Spaniards boast over their newest second-hand acquisition. “In Spain, those who buy things that have been used carry the stigma of not being able to buy brand new stuff,” explained Joana Conill, a researcher of alternative economic cultures at Universitat Oberta de Catalunya. The crisis and social media are changing people’s habits and perceptions so “the attachment of people to objects is diminishing,” said Jordi Griera, president of the Institute for Management and Human Values in Barcelona. He and others says that the economic crisis has also brought Spanish society closer together in a positive way. “The sharing economy is the gate to a cultural change in which people rediscover the power of getting connected with other fellow citizens not only to consume, but also to produce for each other, educate each other, finance each other,” said Canigueral. BarcelonActua is a case in point. More than 7,000 people participate in this local “favor bank” where people help others without necessarily expecting anything in return. There is no control over who gets or gives what — everything is based on good faith. A few days later, a dozen people went to her apartment with “incredible energy” and left it spotless, she said. “Nothing like this had ever happened to me,” Daura said. Grateful for the help, she is now counseling other members of the network on how to start a business, her particular expertise. Rocio Avila, 41, did. She lost her job two years ago and only has the $800 a month her ex-husband gives her to support their two children. When her boiler broke a few days ago, she posted that she needed help to repair it.